Beijing’s « Cambodia Connection ». Rapprochement with China, « From American Friend to American Foe ». Cambodia has been under the rule of Prime Minister Hun Sen since 1998. To describe the nation as a “dictatorship” would be fairly accurate. However, unlike the simplistic narratives spun across Western and Eastern media alike, Hun Sen’s rule has been marked by several turn-arounds, at least in regards to foreign policy. It was in 2006 that neighbouring Thailand underwent a military coup, ousting then US-backed Prime Minister Thaksin Shinawatra. From 2006 onward, Shinawatra, with significant Western support, attempted to manoeuvre himself back into power, both directly and through a series of proxy political leaders including his brother-in-law and his own sister, Yingluck Shinawatra. The latter would finally be removed from power by a second military coup in 2014. Throughout Shinawatra’s attempt to return to power, Cambodia served as a base of operations for US-sponsored lobbyists, media operations, Shinawatra’s own political party-in-exile as well as armed terrorists used on multiple occasions to attack Shinawatra’s political opponents inside Thailand. Relations deteriorated between Thailand and Cambodia so acutely that at one point along the border, with the Preah Vihear Temple conflict serving as a pretext, limited armed exchanges took place leaving soldiers and paramilitary members dead and injured on both sides. However, gradually, and particularly after the 2014 Thai coup that ousted Shinawatra’s sister from power, Cambodia’s foreign policy vis-a-vis Thailand changed dramatically. Prisoners taken during the temple conflict by Cambodia were released back to Thailand, and a general rapprochement took place. Simultaneously, relations between Cambodia and China continued to grow, with Phnom Penh showing an increasingly more decisive preference for Beijing over Washington, particularly in regards to the South China Sea conflict. In exchange, Cambodia has received incrementally increasing military support from China, including weapon deals and joint-training exercises. 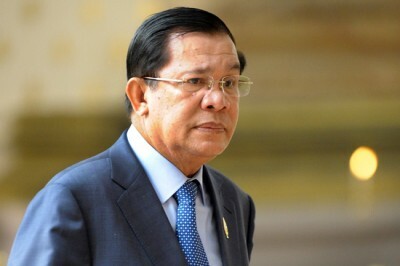 And at the same time of both of these developments, increasing activity among US-backed nongovernmental organisations (NGOs) in Cambodia and US-backed opposition parties began to rally against Prime Minister Hun Sen.
Prime Minister Hun Sen’s comments then, regarding US interference, division and destruction across North Africa and the Middle East, is in direct reference to what he sees as now unfolding in his own country. Having played a role in aiding and abetting destabilisation efforts in neighbouring Thailand, Prime Minister Hun Sen likely “knows” a colour revolution when he sees one. Like in neighbouring Thailand, Cambodia too has a wide variety of US State Department funded opposition parties and NGOs in place, ready at a moment’s notice to utilise “soft power” against Phnom Penh if ever it drifts too far apart from US interests. It is clear that the “honeymoon” so to speak, is over between Washington and Phnom Penh, with the latter clearly perceiving the regional lay shifting in favour of Beijing, but fully realising the consequences of shifting with it in regards to Washington’s penchant for toppling governments that no longer serve US interests. Prime Minister Hun Sen’s reluctance to venture any deeper into US-backed attempts to destabilise neighbouring Thailand may be one part of why Cambodia is now under pressure. The other is clearly Cambodia’s outspoken support of China in the Washington-Beijing row in the South China Sea. While other nations within the ASEAN bloc (Association of Southeast Asian Nations) have attempted to remain neutral, with only The Philippines and Vietnam siding more overtly with the US, Cambodia has served as a more overt supporter of the Chinese position. China has decried the ruling as a farce, and vowed to ignore the court’s decree that Beijing’s so-called nine-dash line, which claims around 90% of the South China Sea, has no legal basis. The Philippines originally wanted the ASEAN communiqué to cite the Hague ruling, but Cambodia objected, leading to days of deadlocked negotiations. In the end, Manila dropped its demands and a joint statement was published Monday. Not only does this bode ill for America’s attempt to transform The Philippines into a vector of US foreign policy vis-a-vis Beijing, Cambodia’s role in blunting the ASEAN statement and in turn, blunting the impact of the US-orchestrated “ruling” sets an example of disobedience to Washington other nations in the regions are likely taking note of. It is also likely an example Washington would like to prevent from being set again. It is a good time for policymakers and the public alike throughout ASEAN to examine the various financial and political ties the US State Department maintains with various groups inside Cambodia in order to properly frame the likely uptick in political conflict Prime Minister Hun Sen seems to be anticipating. While it might be tempting for Cambodia’s neighbours to cynically take advantage of an old adversary’s plight, what Cambodia has now apparently found out, is what’s good for destabilising Thailand, is also good for destabilising Cambodia. The real path forward for Southeast Asia and Asia as a region, is one of concerted balance against any coercive power, whether it resides in Beijing or Washington, A multipolar regional order that respects national sovereignty but also recognises the necessity of regional harmony may be difficult to achieve, but is essential for moving beyond costly regional rivalries and surviving much larger geopolitical contests of power.